Pak Suzuki Motor Company Limited is a subsidiary of Suzuki Motor Corporation Japan, one of the most prominent automobile manufacturers in the world and the leading automobile company in Pakistan. 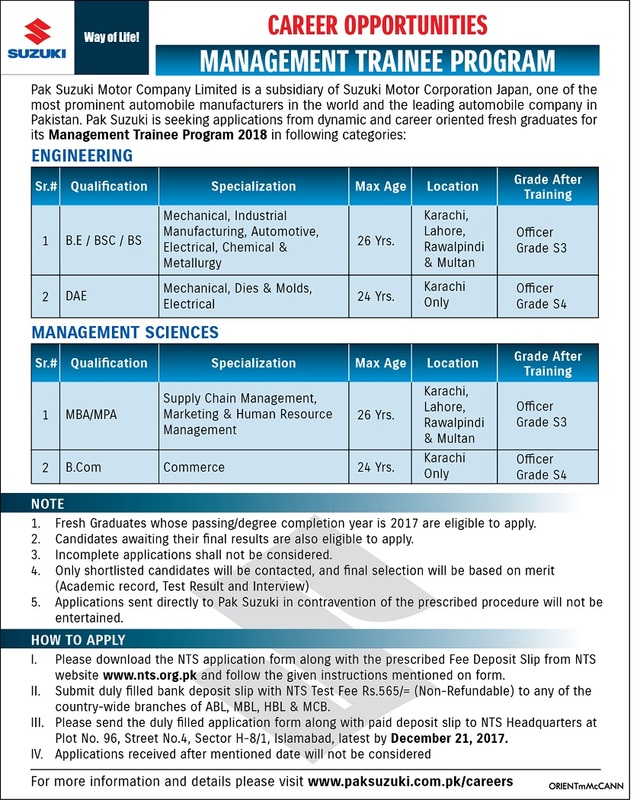 Pak Suzuki is seeking applications from dynamic and career oriented fresh graduates for it Management Trainee Program 2018. Fresh Graduates whose passing/degree completion year is 2017 are eligible to apply. Candidates awaiting their final results are also eligible to apply. Only shortlisted candidates will be contacted, and final selection will be based on merit (Academic record, Test Result and Interview). Applications sent directly to Pak Suzuki will not be entertained.